Our modern, attractively furnished guest rooms and suites offer an oasis of calm in the heart of the Anaheim Resort District’s emerging Platinum Triangle. 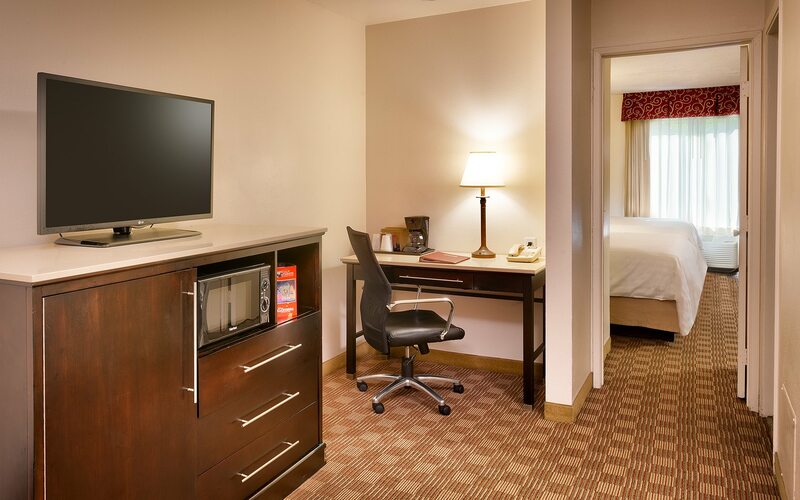 Distinguishing features include 39-inch flat panel HDTVs with premium cable, refrigerators, microwaves and complimentary high-speed Wi-Fi. All rooms and suites are non-smoking. Made for relaxation, our Spa Suite is a haven of peace and tranquility. 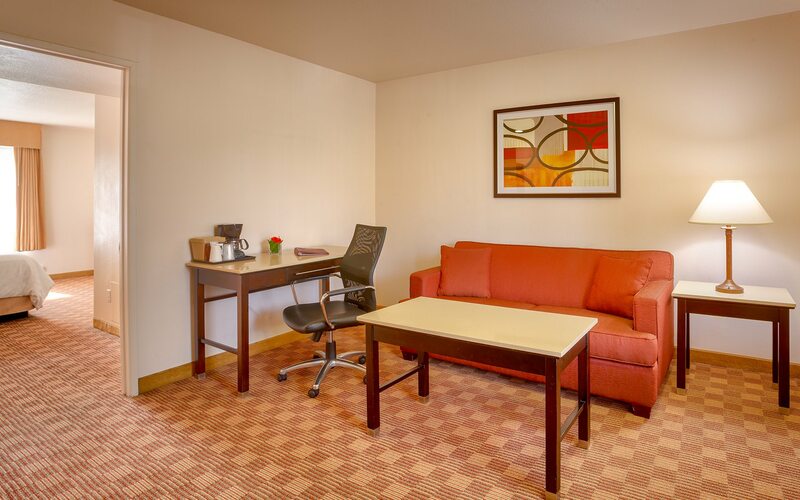 This modern, newly renovated suite features a spacious living room with sleeper sofa, well-lit work desk and 39-inch flat panel HDTV with premium cable, as well as complimentary Wi-Fi. A separate bedroom and bath has a king bed and spacious whirlpool tub. Beautifully renovated, our One Bedroom King Suite combines beauty and comfort. 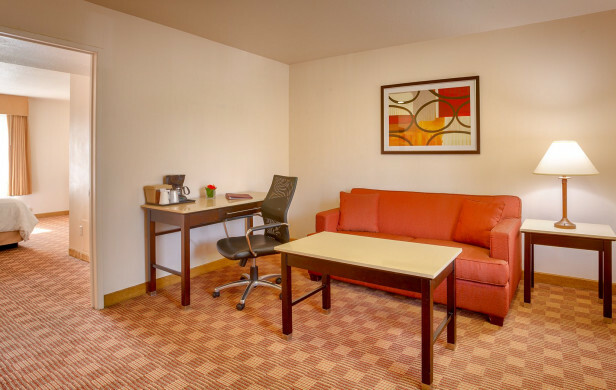 This spacious, modern suite features a living room with queen sleeper sofa, coffee table, 39-inch flat panel HDTV and well-lit work desk. A separate bedroom is furnished with one king bed and a second 39-inch flat panel HDTV, as well as complimentary high-speed Wi-Fi. 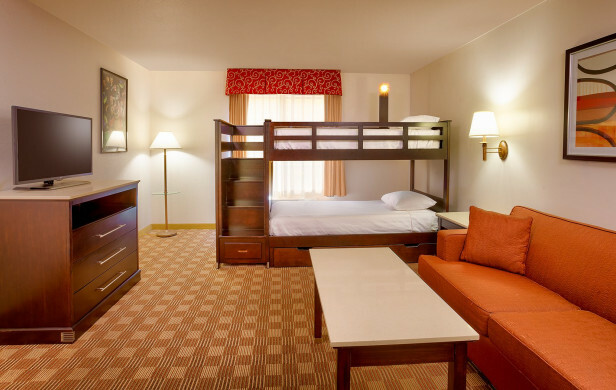 Specially designed for families with small children, our newly renovated One Bedroom Toscana Kids Suite features a king bed and separate bedroom with twin bunk beds and a queen sleeper sofa. Highlights include two 39-inch flat panel HDTVs with premium cable and compatible video game hookups, and complimentary high-speed Wi-Fi. A perfect retreat for families or friends traveling together, our newly renovated One Bedroom Siena Executive Suite is perfect for entertaining. 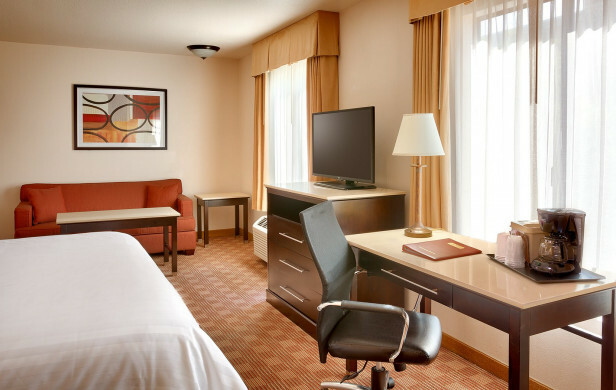 This modern, contemporary suite features a spacious living room with sleeper sofa, separate bedroom with two queen beds and well-lit work desk and chair, as well as two 39-inch flat panel HDTVs with premium cable and compatible video game hookups, and complimentary high-speed Wi-Fi. 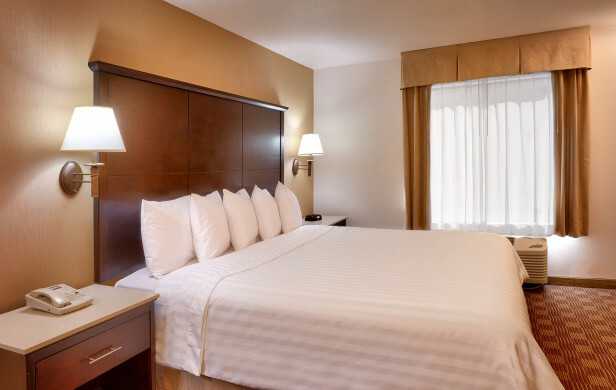 Our Accessible guest room features one king bed and an accessible bathroom with bathtub grab bar (portable chair upon request), lowered bathroom vanity and closet shelf, as well as work desk and chair, complimentary high speed Wi-Fi and 39-inch flat panel HDTV with premium cable. Roll-in showers may be requested and are subject to availability. 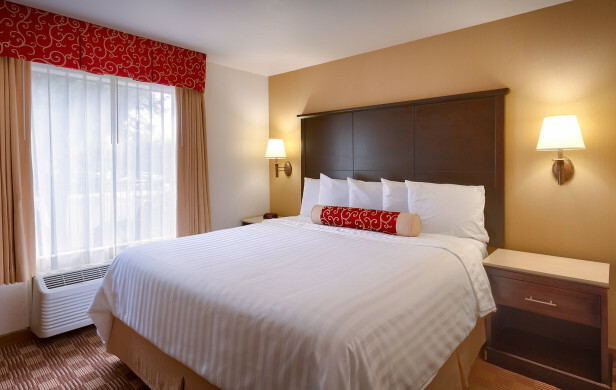 Newly renovated, our spacious Deluxe King guest room is perfect for singles or couples visiting the Anaheim Resort District. Highlights include a 39-inch flat panel HDTV with premium cable, a well-lit work desk and complimentary high-speed Wi-Fi. 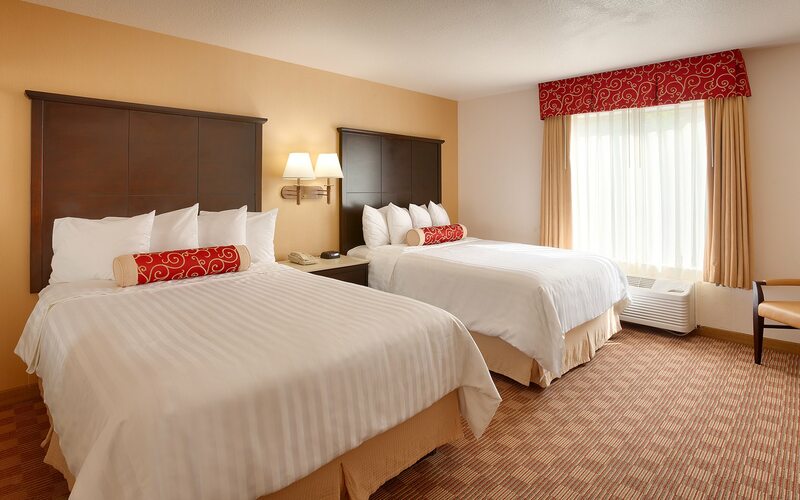 Bright and spacious, our Deluxe Double Queen guest room is an oasis of comfort. Newly renovated, this room features two queen beds, a 39-inch flat panel HDTV with premium cable, a brightly lit work desk and complimentary high-speed Wi-Fi. Our Deluxe Double Queen guest rooms can be reserved with a connecting door.